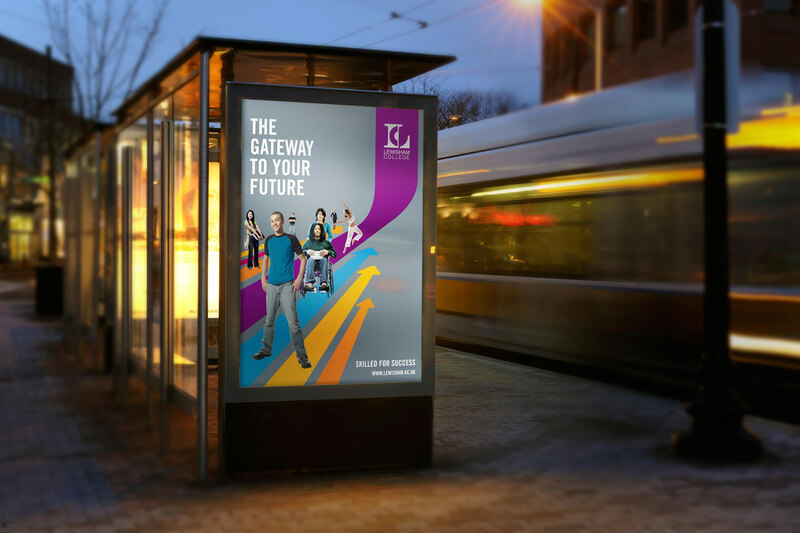 Creating urban uplift through a bright, inspiring visual identity and dynamic advertising. 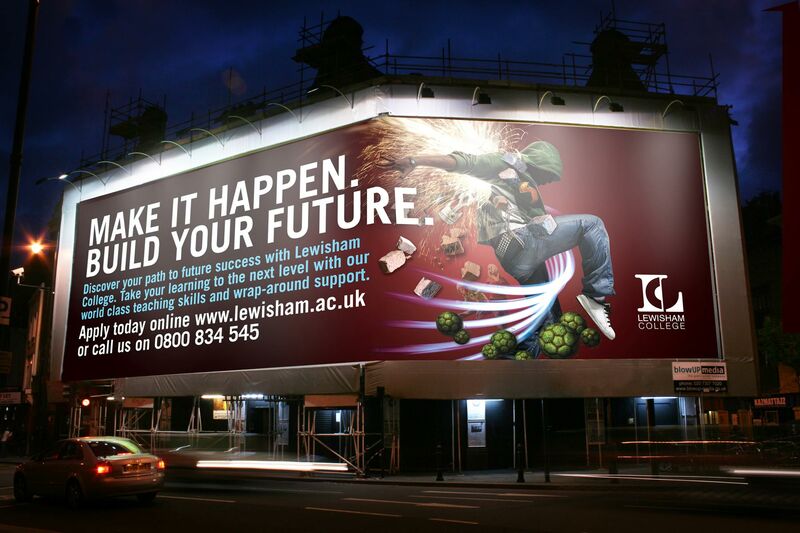 Lewisham College, (now called Lewisham Southwark College) situated in South London, is one of the country's leading further education colleges, with Beacon status and two Centers of Vocational Excellence. 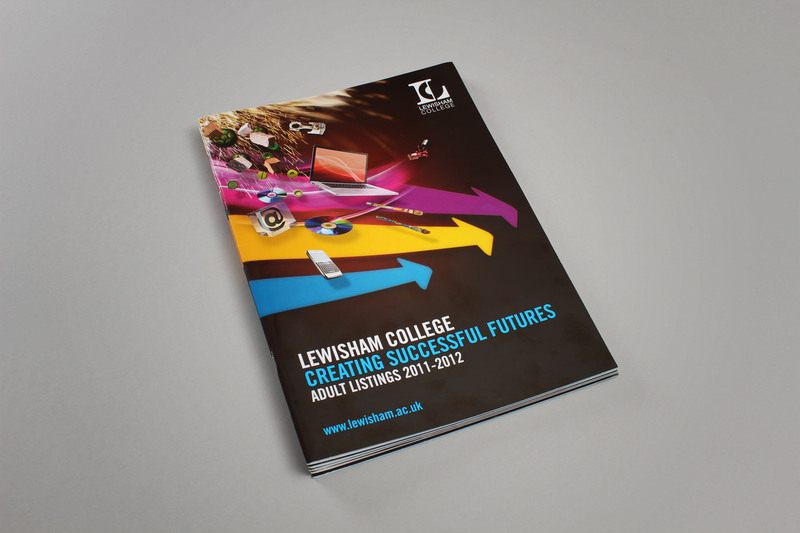 Lewisham College worked exclusively with Firedog over a period of five years with the brief to increase enrolment and uptake in the local area. We began with creating a brand identity and then extended our work into messaging, advertising, campaign and tactical communications support. 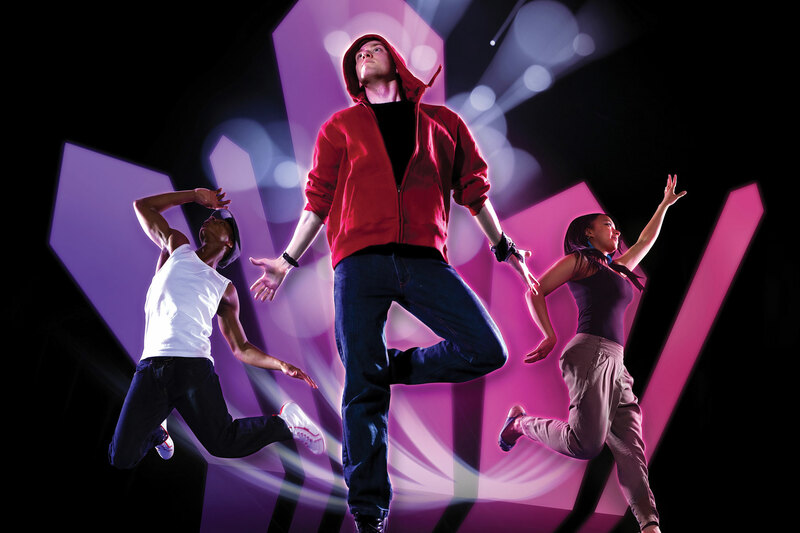 The students were encouraged to jump about on a trampoline, creating vibrant and energetic poses. 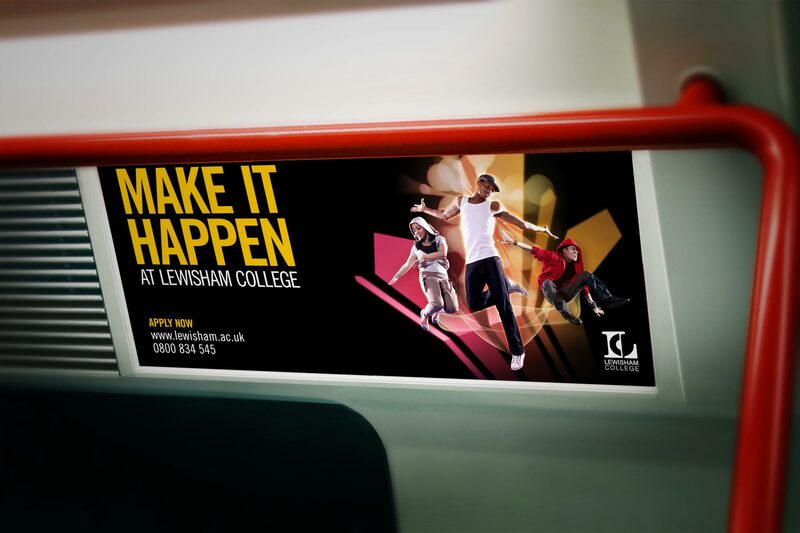 We supported these with colourful graphics which pay homage to the original Lewisham College identity. 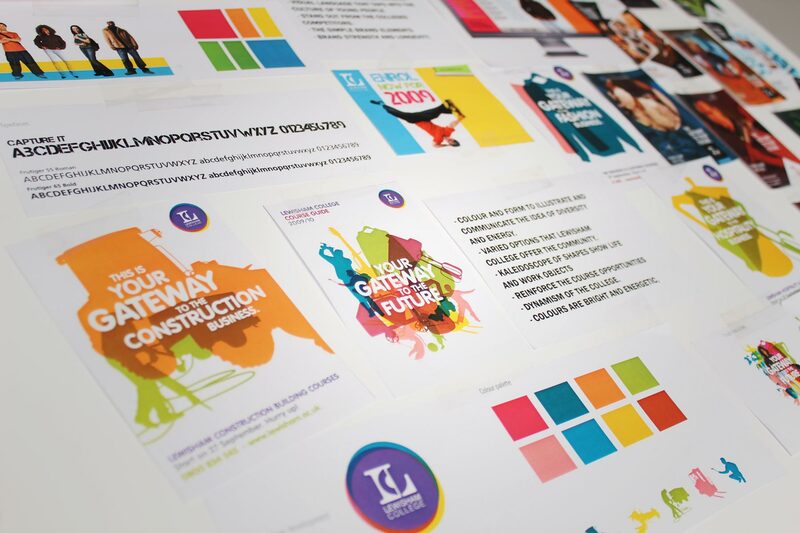 The visual identity rebrand project kicked off with a study across inspirational marketing. We looked at sports and arts influences. The campaign has been applied to both 48 and 96 sheet billboards around London. The layout elements which rest on black are scalable and variable, which makes the campaign easy to roll out across all media. The campaign has also been applied to Adshels and other vertical media. 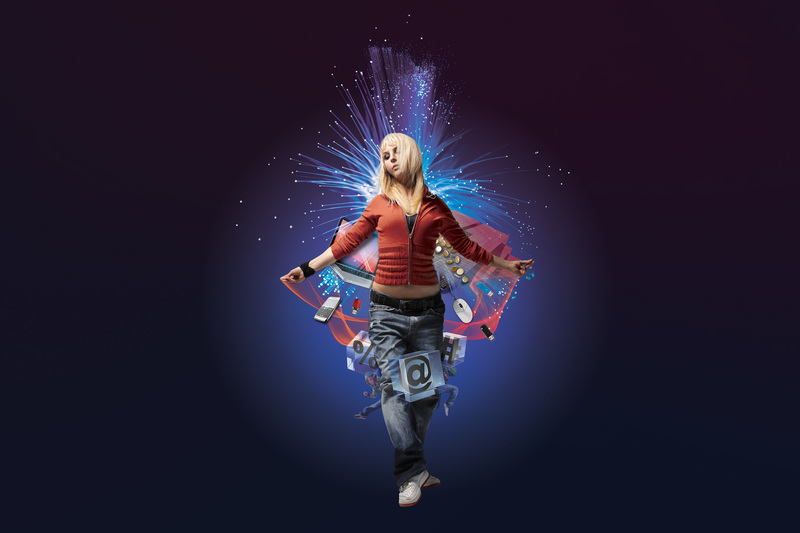 The combination of real student imagery and creative post production creates an engaging and moody virtual environment. 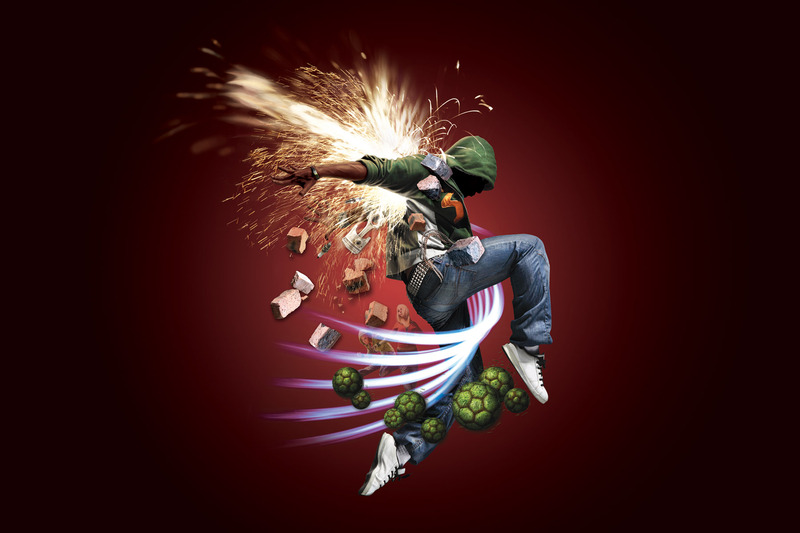 From even the first year campaign, featured here, it has always been important for the target audience to project themselves within the campaign. The campaign extended to local press. This image shows the arts, creativity and beauty application. The campaign also extended to merchandising - Such as a handy travelcard wallet. Very useful in London! The campaign utilised the powerful imagery to its greatest effect supported with hard hitting copy and a strong call to action. In the first year we communicated to the different audiences by showing the primary figure supported by relative devices. Here is the IT and business application. After winning a five way creative pitch we developed our ideas supported by a subsequent quantitave research program. The brand had to adapt to both offline and online media as well as above the line and promotions usages. The primary brief was about building awareness and confidence behind the identity. 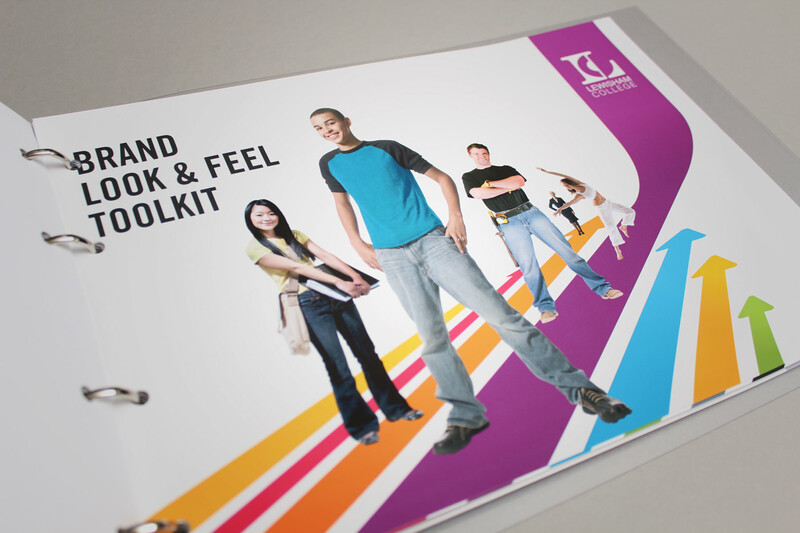 We produced a range of graphic applications which carried this visual thrust. The brand visual identity comprised of hero imagery and strong bright graphic devices - All linked back to the college brand. 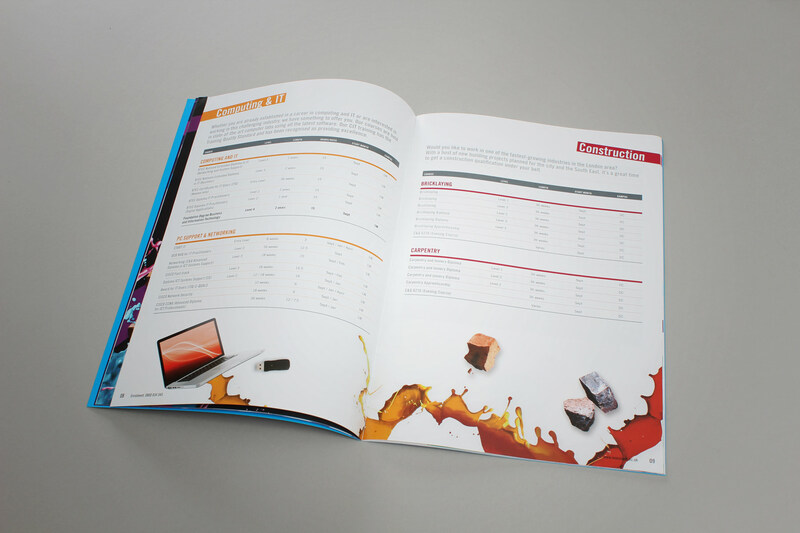 We created an extensive guideline kit so that the college could easily source and utilise local suppliers. 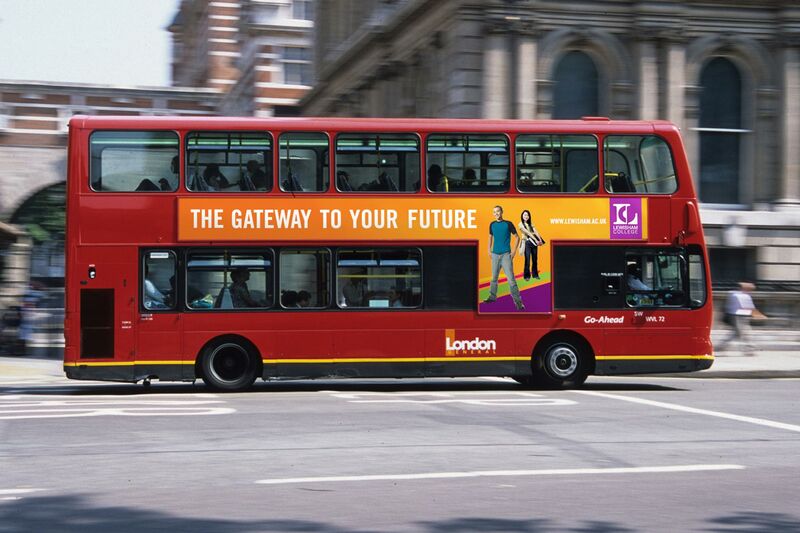 With South East London being a bit grey and urban, the identity looked to create instant standout and awareness. 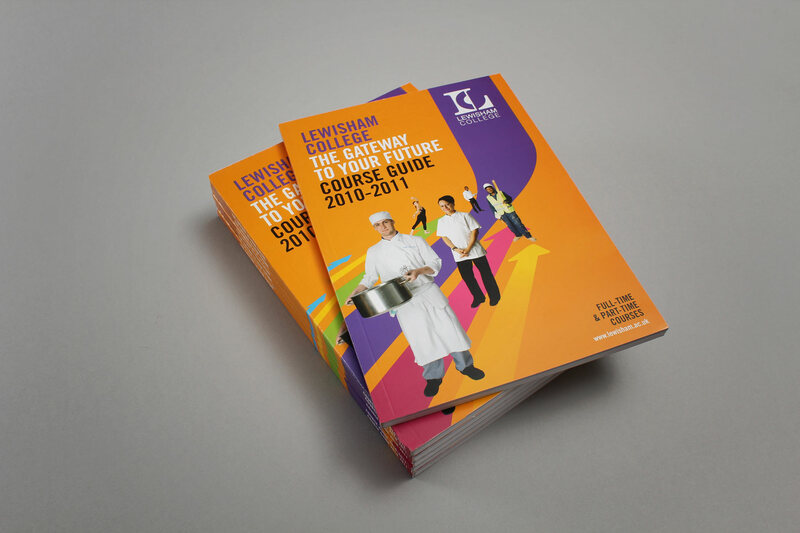 The course guide forms a natural extension to the Lewisham brand identity, also completed by Firedog. The guides consistantly use engaging imagery coupled with bright colours. 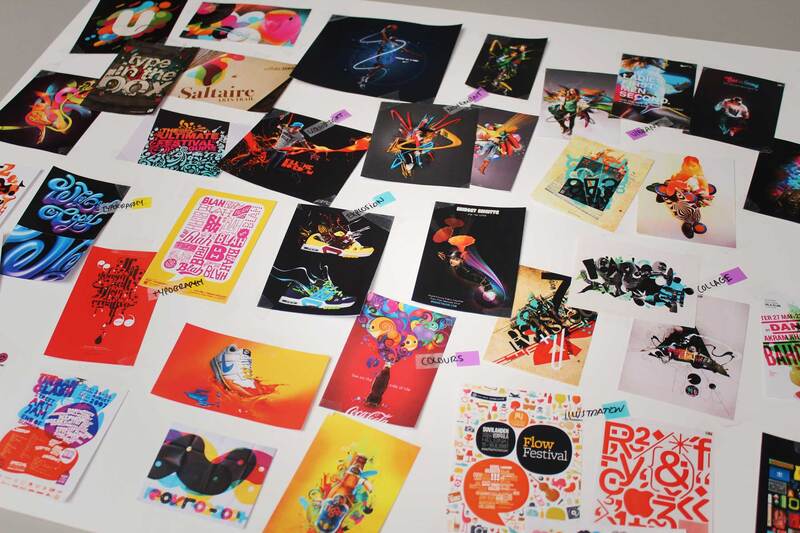 The vibrancy and use of both graphic shapes and imagery creates a striking publications visual identity. Two course guides showing how the brand language has been extended. Coupled with the delivery of the course guide, a specialised publication - The Adult Listings, focussed at the adult learner. 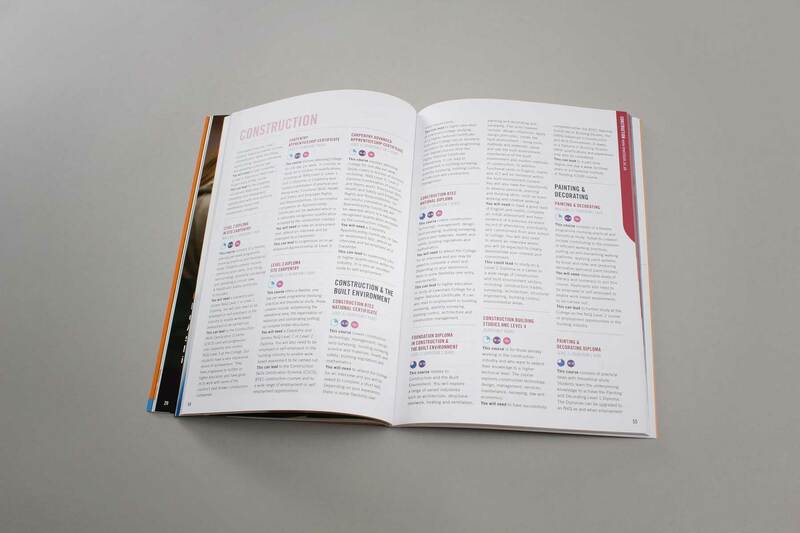 As most of the course publications are over 100 pages, we ensure a dynamic read by providing a number of varied page layouts. The listings have been carefully crafted for ease of reading and reference. The publication reaches the widest possible audience via the use of sophisticated yet friendly design aesthetics. 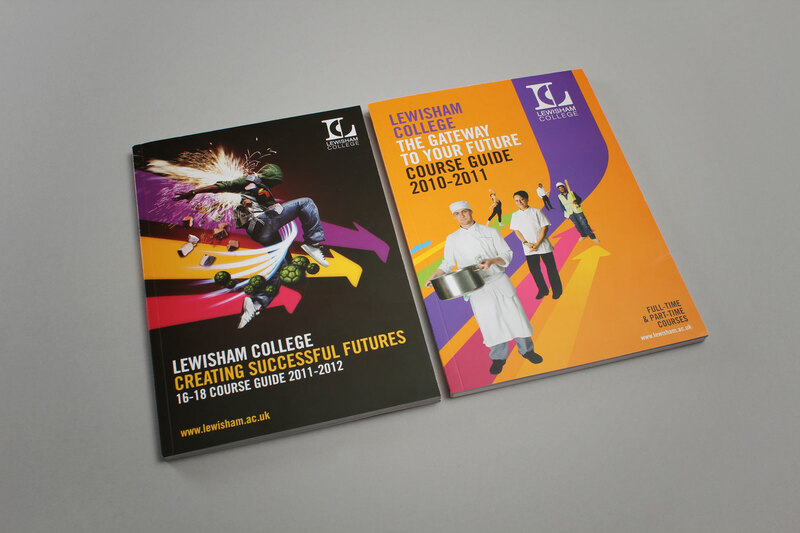 The course guides, whilst containing a different look year on year, all carry the same Lewisham brand values. The resulting combination of formal layouts and dynamic imagery makes for both a confident yet accessible publication. We worked with the client team to carefully select and utilise confident and appealing imagery, always focussed on the student. 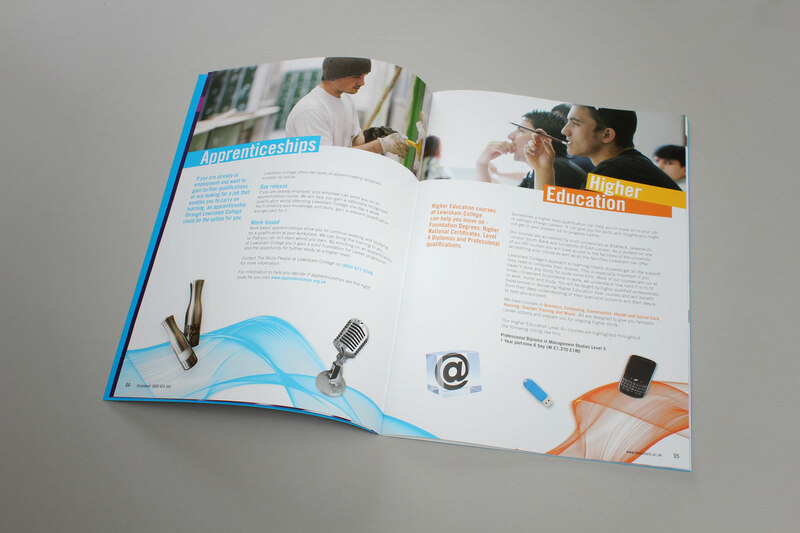 We also have integrated the visual language with the above the line campaign materials which preceded the guide. This helps the audience make a connection between the materials. The hero image communicates a proud and diverse educational institution. 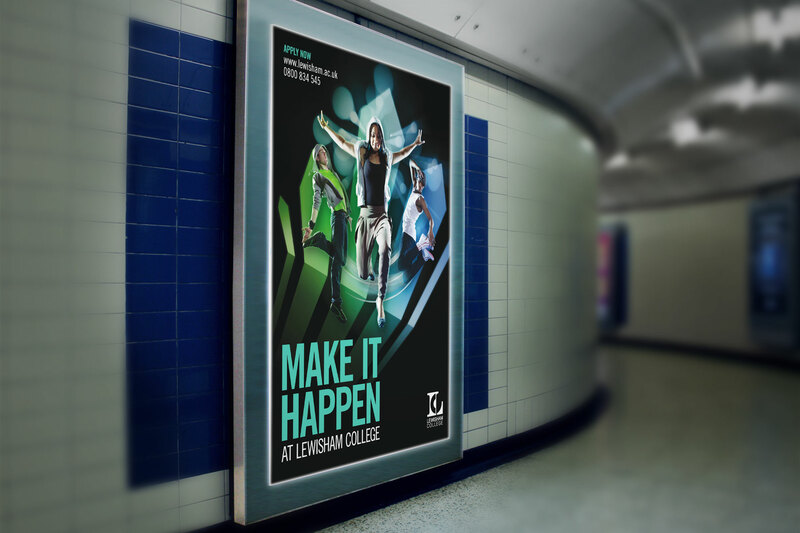 After our earlier brand refresh we extended the visual identity by masterminding a campaign with bold creative and impactful messaging to inspire 16-18 year olds to enrol at the College. Firedog commenced the project with thorough research in order to define what inspires the target London audience. The strategic direction was presented in a visual mood exercise, exploring different corridors to set an appropriate tone. 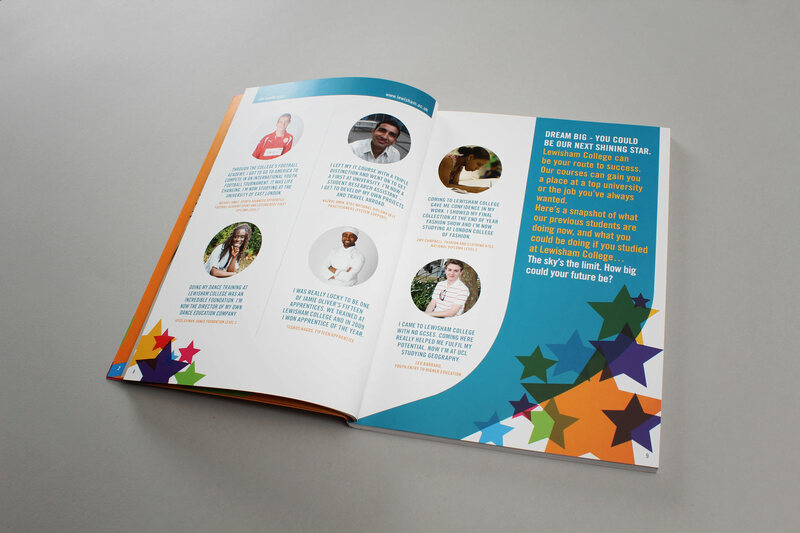 This included a central ‘hero’ image of a potential student composed within a memorable supporting graphic, communicating a diverse yet highly competent institution. The resulting imagery is highly creative, expressively dynamic and progressive. The strategic direction took its cues from leading sports brands (e.g. 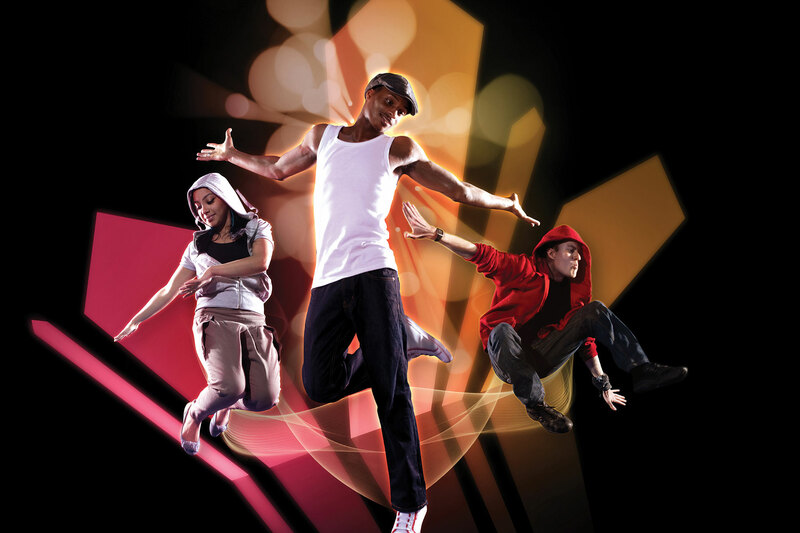 Nike) where the campaigns are highly inspirational and command the audience to ‘be their best’. The campaign was divided into three course segments in order to appeal to all College audiences: IT-Business-Engineering; Art-Creative-Health and Beauty; Sport-Construction-Outdoor. The resulting imagery is highly creative, expressively dynamic and progressive – all supported by strong headlines and call-to-action messaging. 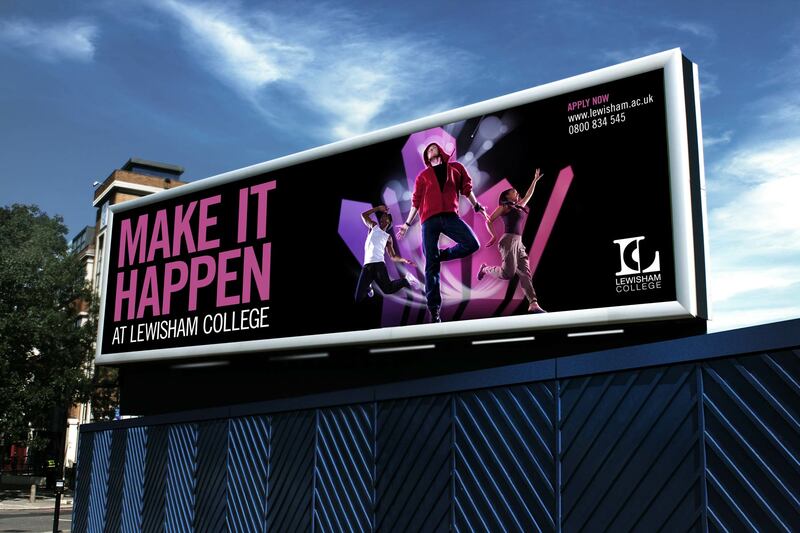 The campaign certainly creates stand out for Lewisham College in the higher education market, appearing on the back of buses, billboards, posters, magazines, newspapers and leaflets. The campaign increased applications for study by forty percent. Three key images were selected to form the base of the campaign and each one was taken through a series of visual post production. 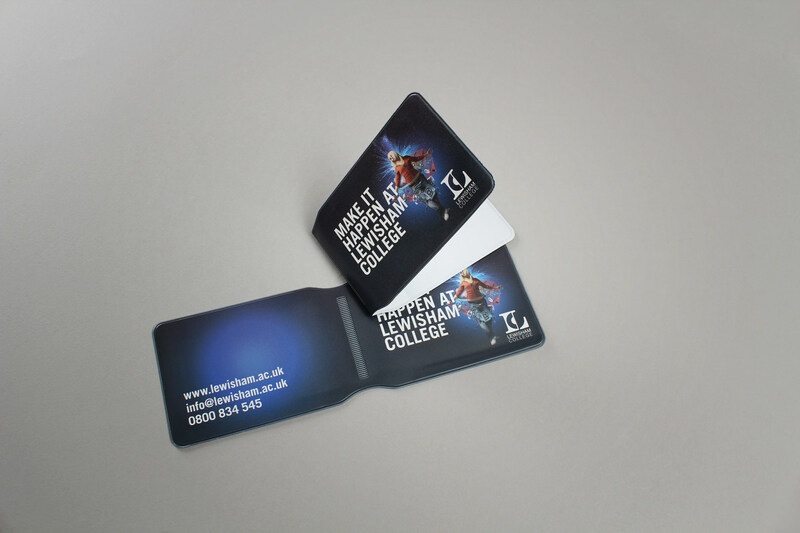 For the most recent campaign we tie imagery of real students with strong graphic devices, creating a vibrant and memorable impression. The campaign has been run for two years in a row and has increased applications for study by forty percent. The campaign graphics have also been extended into the entire online communications strategy and social networking channels. Key insights from the research influenced the direction of the brand concepts and inspired the visual look & feel. Initially, we were tasked with producing a brand that truly reflects the outstanding, diverse and exciting nature of the College. 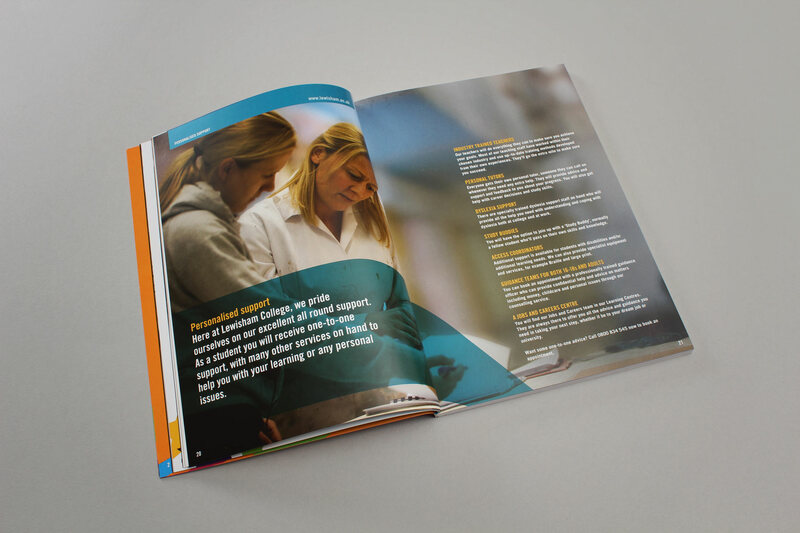 We were to build on the college’s existing logo and develop all areas of the brand, including producing a suite of brand images. Firedog began by undertaking proprietary research with a focused questionnaire to the college’s current staff, students, local teachers and potential students. Key insights from the research influenced the direction of the brand concepts and inspired the visual look & feel. The arrow graphic device and colour palette used represents diversity and aspiration. One of the main insights was that the cultural diversity of the College is seen as a positive by 78% of the students and staff who completed the survey. 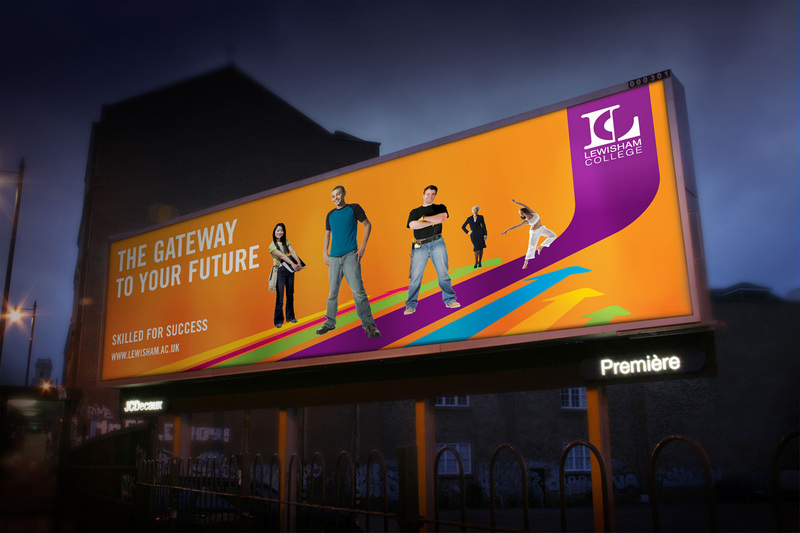 The arrow graphic device and colour palette used represents diversity and aspiration, the arrows symbolising the progressive nature of the college, leading upwards to demonstrate the aspirational qualities of the students and staff. The supporting imagery presents an image of confidence with subjects looking directly into the camera, smiling and confident. The final brand was supported via training the college’s in-house marketing team. The adoption of assets and guidelines ensured consistency and brand strength going forward. 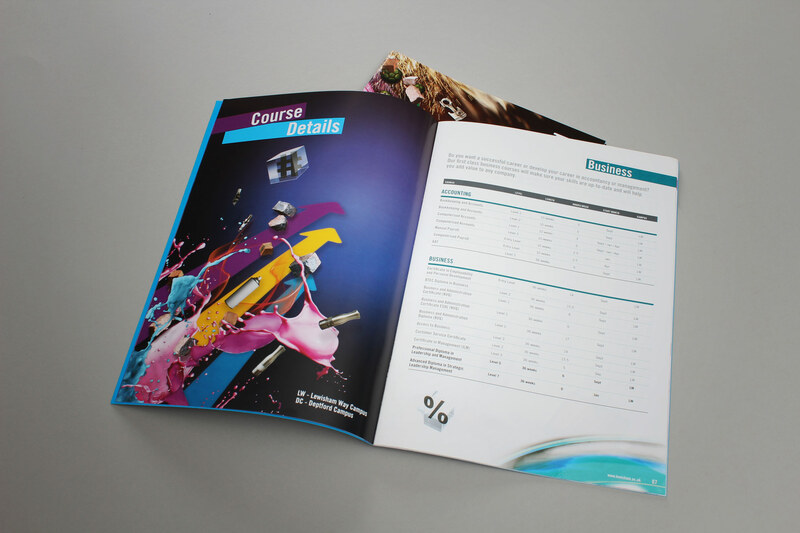 With the high number of students with learning difficulties, the course guide needed to be kept highly accessible. 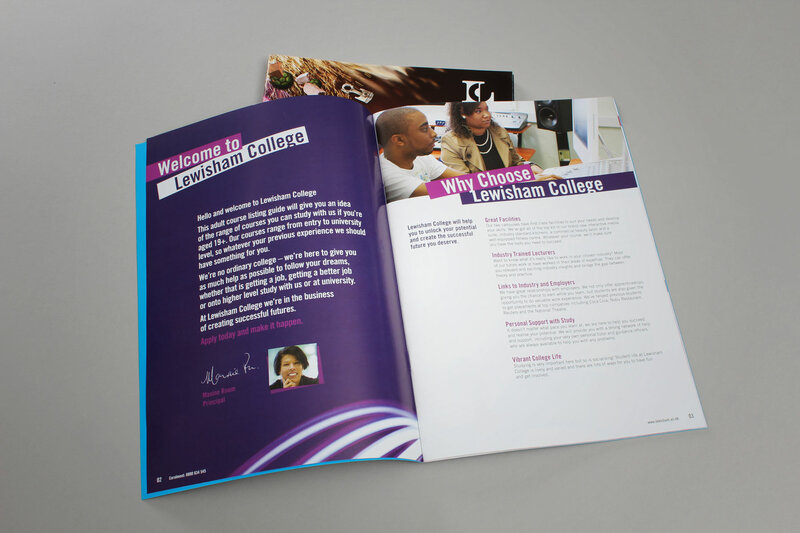 With the brand look and feel under the belt, Firedog was asked to bring the 2009 course guide in line with the new Lewisham College visual brand language. 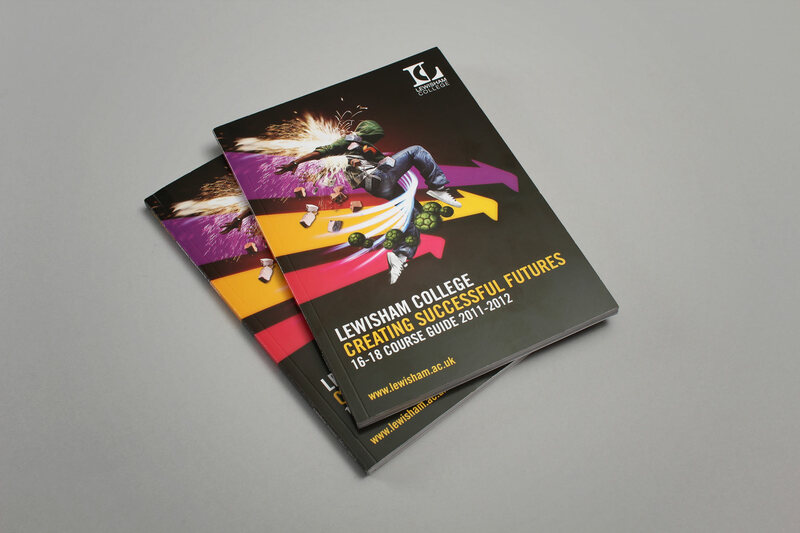 Firedog presented three concepts to Lewisham College for redesigning the course guide. 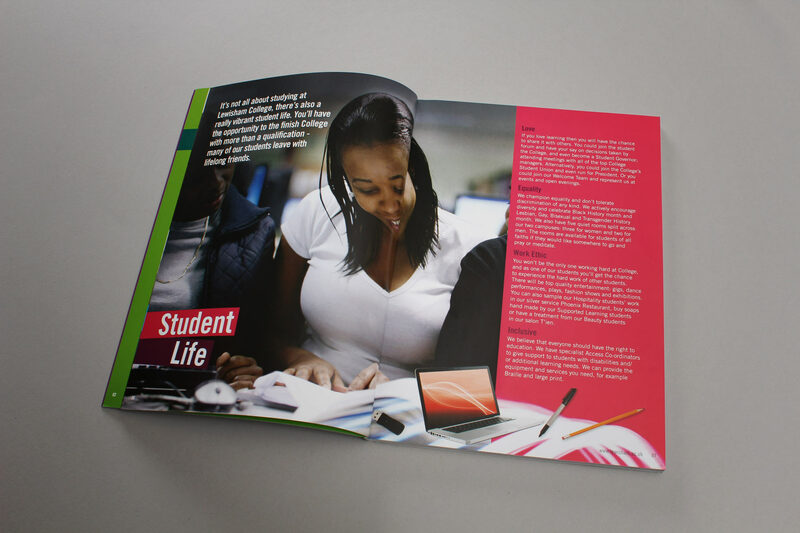 One key consideration for the creative team was that with Lewisham College’s high number of students with learning difficulties, the course guide needed to be kept highly accessible. 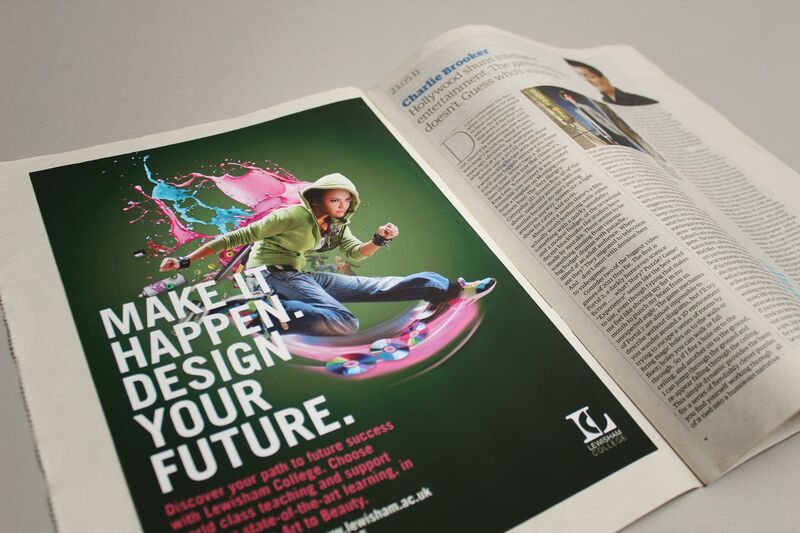 For the introductory section, the College selected a concept that used the arrow devices from the look and feel, blown up to become large bold, areas of colours. Full page imagery of ex- and current students shot on location in a reportage style. Into this was placed full page imagery of ex- and current students shot on location in a reportage style. The second half of the course guide is the course listings. Firedog was tasked with making this section clearer and easier to navigate. Firedog overhauled the existing system by introducing a tabbed colour system to divide each departments’ courses. This was coupled with a revised icon and key system for the course attributes and laid out on a three – rather than two – column grid structure, resulting in more space for the College to write about their courses. The finishing touch was using different paper stocks as a tactile way of separating the sections. We have gone on to produce the course guide over a period of three years. The guide has also been supplemented by an adult learning listings publication, which works hand in hand with the course guide.